Thanks to Kim K and her infamous highlighting routine we have all been made aware of banana powder. Stemming initially from Ben Nye, banana powders are now cropping up left, right and center. Now let me be technical here for a sec, these powders aren’t actually called banana powders but for the sake of this post that’s what we’re gonna call them. These powders are essentially yellow toned finely milled powders used to set your highlighted areas and to help allow that area to pop a little bit more against your skin tone. Nowadays, you’ll hear this referred to as ‘baking’ if you watch YouTube tutorials. Baking is a trick taken from drag make-up routines, where a substantial amount of powder is packed onto the area that needs to be set (normally the chin, under each eye, below the contour line, bridge of the nose and sometimes the forehead) to bake, this method not only sets any cream bases which are normally quite heavy and full coverage but also provides that flawless signature matte look. 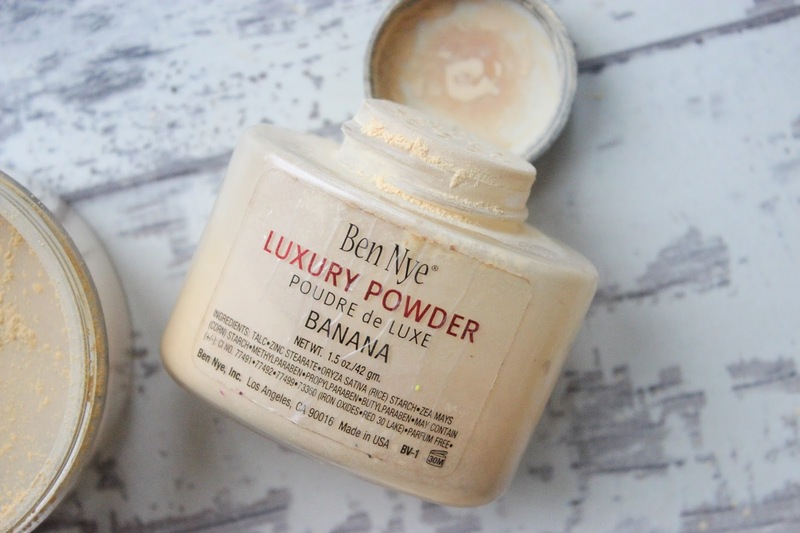 Since the success of the Ben Nye Luxury Powder in Banana a whole host of make-up companies have produced their own banana powders loose and pressed for olive to dark skin tones. 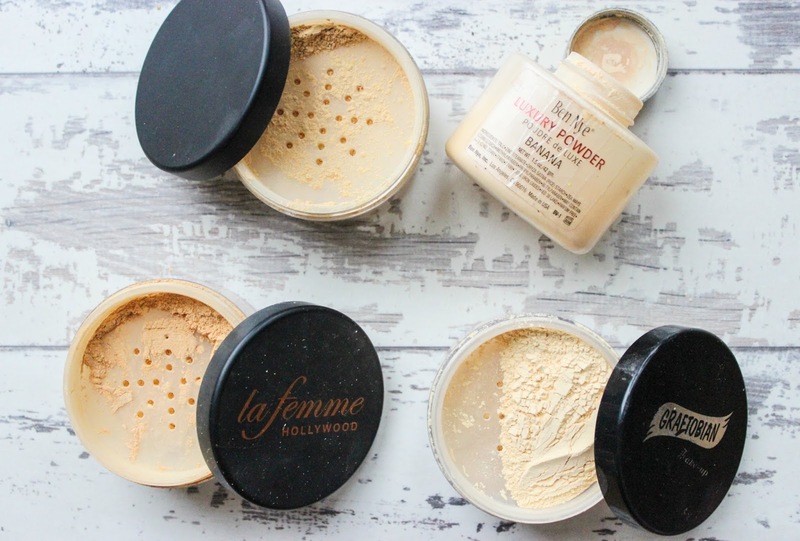 I’ve managed to add 4 of these powders to my collection. The OG of banana powders and still one of my favourites because Ben Nye knows how to do powders – pressed and loose. Lightweight and very finely milled, this banana powder is great for setting highlight on a majority of skin tones. There has been some controversy as to whether this powder is suitable for POC, some say no, some say yes. I say, it all depends on you. I have no issues whatsoever with setting my highlight with Ben Nye Banana Powder (BNBP) and I know many other POC have no issue either but some do believe that banana powder is too light for POC. I think it’s a bit silly telling all POC that we cannot use a product because it didn’t work for you but I guess that’s just me. If you are comfortable with banana powder – use it. In terms on tint, BNBP is a slightly cool toned yellow, which I can understand may put off POC but the trick is to not pack it on or bake with it and if you do, make sure you brush it off well and blend well with your foundation powder. For simple setting (using a brush to lightly apply the powder) of your highlighted areas I don’t think you can go wrong with banana powder at all. The fact that it is so finely milled means that it will set your cream/liquid highlight perfectly, giving you a matte finish without weighing down your skin. If you’re looking for a more vivid highlight, BNBP is the way to go. My main issue with the BNBP that it can be very drying for my skin. At times I can see creasing which isn’t cayute gurl, plus this bottle is less than user friendly, you’ll find that you get banana powder EVERYWHERE and you’ll also end up wasting a lot of it. You can see me use it in action HERE. Graftobian’s Banana Cream Pie (GBCP) can be quite tricky to get a hold of in the UK however I picked mine up from IMATS where there is always a Graftobian stand – side note: check out their HD’s foundation palettes, you’ll love them! 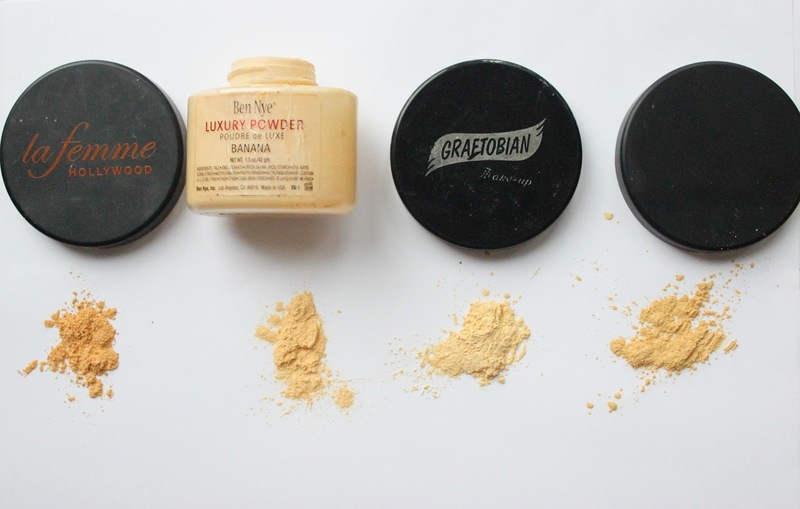 In a very user friendly tub, Graftobian’s version of banana powder is a pleasant one. I find GBCP to be silkier than Ben Nye’s Banana Powder which makes application fairly stress free for me. I like to apply this with a wedge sponge which means I tend to lean over more to the baking side rather than the setting side of things. When I do use this I find that I do not experience creasing and that it blends out fairly well, with no creasing or ultra visible light cast which was unexpected on first use as GBCP is slighter lighter in tone compared to BNBP. I find myself reaching for GBCP quite often as I use it for “everyday subtle highlighting”, if you love a subtle highlight for the day time, I would recommend GBCP. 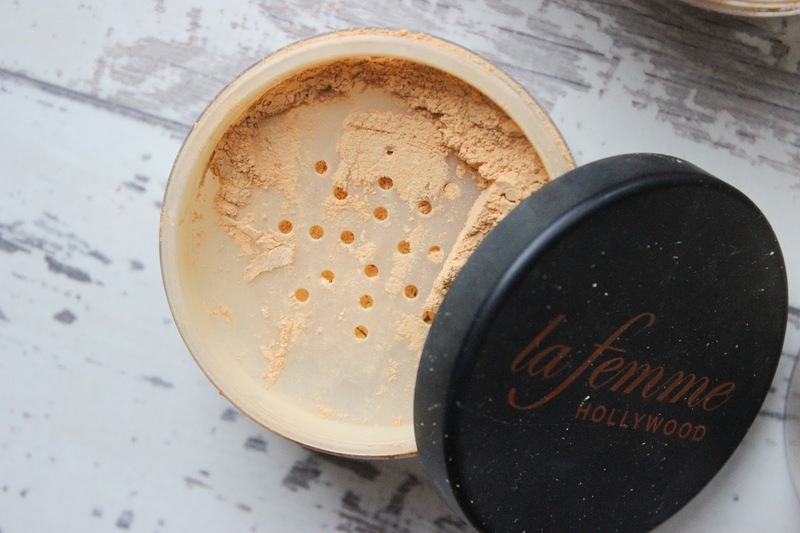 I have to say the La Femme Velvet Touch Face Powder (LFVT) is my least favourite of the bunch. I picked up this affordable offering because of the price but I rarely find myself reaching for it. The powder, whilst very much warmer than it’s counterparts, just doesn’t work for me. 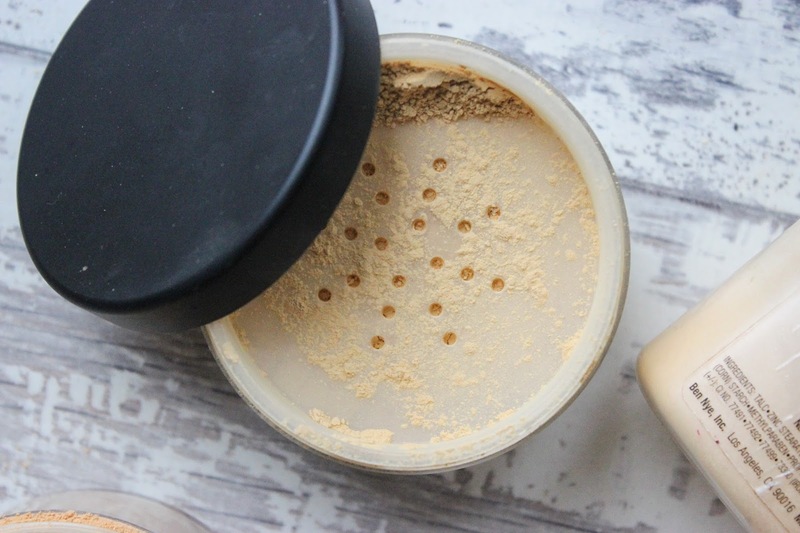 The tint is far too strong and the powder itself seems heavy, less finely milled, making it a chore to blend out when compared to the others. In the end I find that I’m left with an oddly coloured cast on my face. For me LFVT just doesn’t hit the mark. Packaging wise I’m a fan but unfortunately for everything else, it’s a no from me. The powder that all POC have been talking about in the YouTube world. 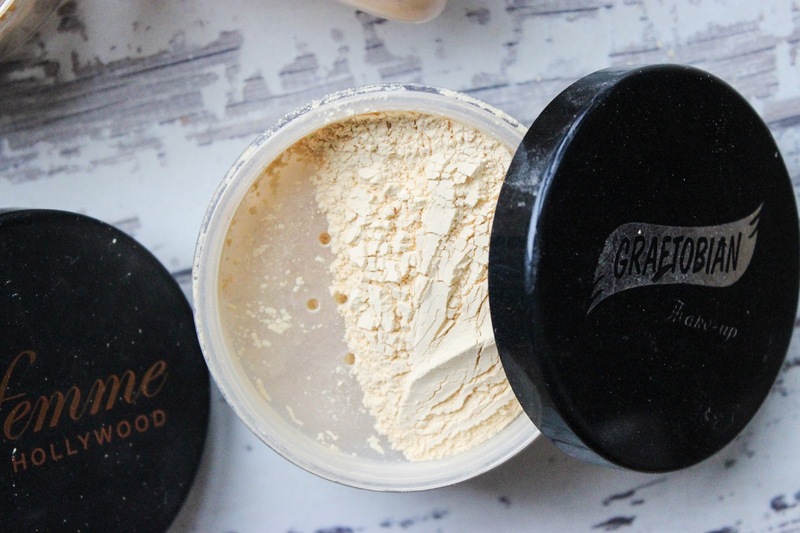 This powder, if you’re in the UK, is also a pain to get a hold of as it’s usually sold out EVERYWHERE but with a bit of a wait or a more thorough search you can find it sold for around £16-£18. I wouldn’t pay anymore than £18 for this product. Even though this is fairly new to my collection I can see why this powder is loved, I really can. It’s warmer than Ben Nye and Graftobian but not as drying as Ben Nye’s Banana Powder. I find when I use this to set and bake it sets my concealer and blends out a dream, even for reverse contouring. I also find that I’m left with natural looking highlight, nothing too harsh but visible enough for my skin tone. Consistency wise, this is another powder which is finely milled which helps with it’s more natural appearance. I find creasing with this is minimal to none at present but since I am yet to use this for a dramatic highlight, I’ll come back and give you guys a more in-depth review very soon. You can see my wearing Sacha’s powder HERE. So in short how do I rate these? What banana powders do you recommend? Thanks Sharon, they are both good banana powders! I usually use the Banana Powder for setting my concealer especially, but I have heard quite a lot about the Sacha Buttercup, I'm going to give it a try! I would definitely recommend the Sacha powder if you find Banana powder a bit drying! Loved this post. I have BNBP and the Sacha and I agree with everything you said. I think the issue with BNBP is not that it's too light for POC, but that it's not always necessary to bake with it if you're very dark skin. Nothing wrong with using a little bit of it as a setting powder imho. Great post! I LIVE BY Sacha Buttercup Powder!!! Even with a full glam look, I don't get any creasing or cakey powdery spots. I need to start using it again, I really liked the yellow tone it gave!